*For some reason, we don’t want to make the company Mason work for public, so I use XH to refer to the company in this article. Mason, the development manager of XH telcos in Singapore, the father of two. He is such a modest man that he call himself “an ordinary employee in the field of IT”, “far from an expert” while other people believe that he is successful enough. On Zhihu (Chinese Quora), he got thousands of upvotes by answering a question inadvertently. Most of his projects are what we called “enterprise products”. For some reason, there are more restrictions in the design and development of this kind of products, but it didn’t stop the man discovering pleasure and dedicating himself to it for a dozen of years. The talk with him reminds me of the saying “the more one knows, the more he felt himself ignorant.” I did benefit a lot from his talk, which is full of “hope” and “disappointment”, “dream” and “reality”. Perhaps you’ll also be inspired in some ways. In this interview with Chinese designer, I have Mason, the development lead in XH telco here. He will share his opinions on product design and development with us. After graduating from National University of Singapore, Mason became a developer,double as the designer in his company. D: What’s your major in university? M: Computer science. So I have received professional training. M: Yes. It’s back-office software.Not used by users directly. No UI. D: No UI? Will you explain that for our readers? M: Of course. That’s a API platform of short message service. One side on SMS, the other side is connected with third-party service provider. In the age before smart phone, people held voting or ordered taxi by short message. D: Was there a big difference between your expectation and the final product? M: No. In platform development we can make many decisions. It’s just like making Jack and Plug, the jack maker can decide the standards and the plug maker has to follow them. D: Did you encounter with some impressive troubles when developing the product? M: lol… the product was, we demonstrated the data bandwidth on the spot but failed(undiscovered bug), so we had to fix the bug in front of the clients and we finally make it. D:What about the bid? Did you win it? M:No. The company collapsed for that. Not the bug to be blame, the competitors’products performed worse. There are indeed some uncontrollable factors in Indonesia state-owned enterprise procurement, you know. It seemed that Mason has told us a sad story, but I felt he was smiling when typing these words. “Life shrinks or expands in proportion to one’s courage.”If Mason gave up for that, he won’t make achievements like this. Compared with that of customer-facing products, the design and development of enterprise products face more restrictions and challenges since the demands are more complicated. It’s easy to say whether the design of an enterprise product is good or not, and the designers are also under more pressure. Until now Mason has been in the field for a dozen of years and he will introduce his experience and feeling in the following part. D: What do you think is the biggest difference between the UX design of enterprise products and that of the customer-facing products? M: In the customer-facing case, a bad experience is very likely to scare the users away. However, the users of enterprise products have no choice since the purchase decision is made by a small number of people. Those who invest money, clarify demands and use products are three different groups of people. So a bad experience has little effect on purchase decision. D: So, the UX design of enterprise product are in fact easier in reality as you only need to meet the demands of those who put forward them. The feedback of users has little influence. M: Sometimes that’s true. To be honest, there are very few enterprise products which has good UX as UX in enterprise is of low priority, but the money has to be spent where it matters. D: Do you think that enterprises will pay more attention on EUX in the future? After all, the products are used by their own employees and the convenience of employee also contributes to the company’s development. M: Hard to tell. The ROI must be guaranteed. If we say “enterprise will definitely benefit from EUX”, then the benefit should be measurable. A lack of measurable ROI makes the investment on EUX hard to be justified. D: Are there any other causes of the ignorance on EUX? M: If the product is used in high frequency, the users will quickly master it, so the UX is not so important quickly. For those used in low frequency, the ROI is too low. D: Do you think there is the necessary to put forward the concept of EUX? M: Of course yes. But you should know how to affect the decision makers. When necessary, be an advocator. Pay attention to your manners and you’ll get pleasure from creating and discovering. For example, when the clients ask you to add some features to a product, usually the background is complicate dand the real solutions are in fact ignored. Have you heard about the story of elevator and mirror? The users of a high building complained that the elevator came too slow and asked the engineer to solve it. Finally, the engineer installed a mirror in the lobby. He didn’t change the speed of elevator but the users complained less. Mason is not sure about whether EUX will be put in a more important place in the future since a lack of measurable ROI. But he did find “pleasure of creating and discovering” in his work. Design and programming won’t be combined, but the age of AI will come. 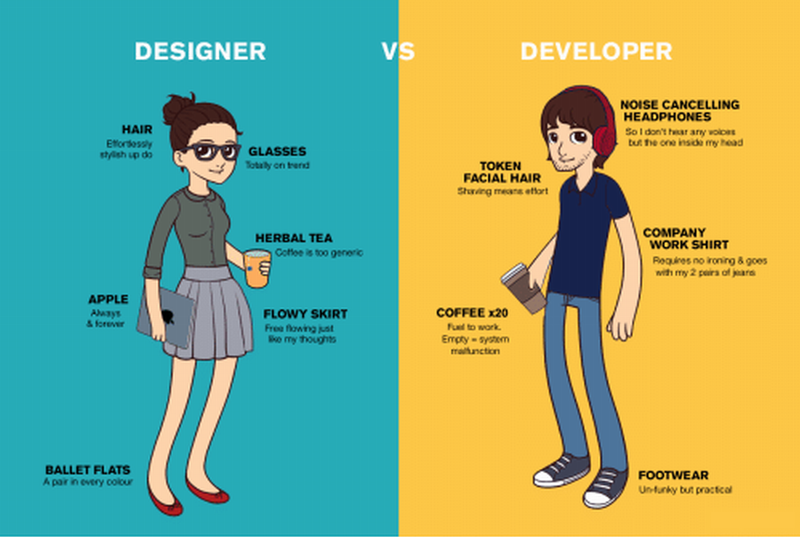 D: You are both a designer and programmer. Do you think design and programming will be combined in the future? M: I have also been pondering. The concept of design comes initially from the producing of physical product. The final product of design is a group of information including drawings and specifications while the results of producing are physical products designed according to the information. However, in software development, the software itself is information. That is to say, both the results of design are information. But there are some differences. The biggest one as far as I can see is: the former is for people to watch, and the latter is for machine to execute. D: Does AI have something to do with it? M: Exactly. In my opinion, AI can derive language without ambiguities that can be understood by machine from design products with ambiguities. This would be the age where people can make products directly by designing. D：Do you think there would be fewer programmers at that time? M: I don’t really think so. For those untrained, the ambiguities in expression will always exist. It’s true that AI can solve a sort of problems, but the new problems will emerge with the development of productivity. Therefore, it’s possible that programmers will always have a place. Enterprise product: the users of the product are employees in the enterprise, not the customers in the street. For example, the human resource management system,inventory management system, etc.